Expertly peel, slice, and dice fruits and vegetables with this Mercer Culinary M23930BL Millennia 3" paring knife with blue handle! While this knife's straight edge is perfect for cutting ingredients, its spear point design allows you to pierce through thick crusts or skins with ease. The ergonomic, blue handle is made of durable Santoprene for a no-slip grip and it incorporates curves to ensure that the knife will fit comfortably in your hand as you tackle small, daily cutting tasks. I'm a fan of Mercer knives and these are no exception. Mercer always arrives razor sharp right out of the package, so be careful. Having color coded knives is great when working with different types of foods. It helps avoid cross- contamination. These are an amazing value in paring knives. They only cost a little more than cheap junk, but come razor sharp and actually hold a decent edge. They are probably the best value you can find in a knife. Perfect knife! I love the different color options. We used these in a cooking camp for kids and the kids loved them. I would order them again. I was quite pleased with how sharp this knife was when it arrived at my door. It's the perfect size for dicing cheese or peeling fruit. The brightly colored handle makes it easily visible in a sink or dish drying rack, which I think will help avoid accidental injury. Mercer Culinary Knives are my favorite knife brand on Webstaurant. They are always sharp, good quality, great price and the colorful handles helps differentiate between different styles. I really like this parring knife. it is surprisingly good quality for the price. i like that it is color codded, it helps me find it easier in my drawer of many knifes. Plus its my favorite color. I cannot say it enough about these knives. They are the BEST hands down! I will never buy another brand or knife again. This company knows what they are doing. I've had mine for over five years now and they are just as good as when I got them. Only sharpened them once since they were purchased! AMAZING KNIFE!! don't let the price fool you! If you are looking for a reasonably priced pairing knife this is a good choice. 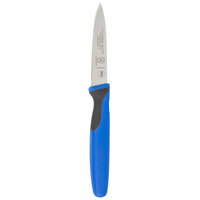 This blue handled Mercer Culinary knife features a high-carbon, stainless steel blade and a no slip grip handle. We would recommend handwashing this knife. Super sharp! Every kitchen must have a paring knife and this mercer paring knife has more than proven itself as a worthy addition to our set. I like this knife it is small handle for me. I also have the bigger blue handle knife and it works great to. The prices are very good also. I love the blue colored handle on this knife. It is very eye catching and makes my kitchen more colorful. It is a very affordable knife but quality made. You can't go wrong with this! I will purchase it again if needed. Love these Mercer knives. Super sharp and non-slip handles work great. What sold me was the cool colors. Seems like they will last a long time. Mercer M23930BL Millennia 3" Paring Knife with Blue Handle this a great knife for the money we buy them all the time , it's very sharp . This little 3" paring knife is awesome! It's very sharp! I use it to cut my fruit up! It's small enough to fit in palm of hand! Great cost effective knives. I teach a culinary class and these are perfect for student use. They are easy to and handle and clean. They are a great size for multiple uses. This is a sharp knife. Color coded blue for fish is great for any kitchen as it helps eliminate cross contamination by keeping specific foods completely separate with different food specified utensils. This is a great little paring knife. I really like the feeling in my hand and the sharpness of the blade. I am very satisfied with this product. I love all the knives in the Mercer Millenia line. This knife is a great small paring knife, and hasn't bent or lost it's sharpness after a year of wear and tear. Very Satisfied. LOVE this paring knife with the blue handle. it is the perfect size. The grip fits my hand just right. We have sharpened it a few times and it has held up very well. These come very sharp, are easy to keep sharp, and look nice. The bright blue handle makes them easy to see, and the non-slip grip is good for safety. This paring knife is great. It's good quality and holds up well. The handle is a fun color and is comfortable to use. Great buy! A good price on a good quality knife and they seem to hold an edge so far. I also like that I can get a set with all the same color handles. These are great little paring knives for seafood prep. They are sharp as razors when they come and fairly easy to keep sharp. I can only recommend them. Good solid knives that perform very well. We've been using them for more then 10 months now and are very happy with how they perform. The 3" is a pretty handy for the smaller tasks. I love Mercer knives they are so sharp right out of the package compared to my expensive block set. It has now been given to a charity. And the Mercer knives are now my knife of choice. great knife and very sharp this Mercer M23930BL Millennia Primary4 3" Paring Knife with Blue Handle love this brand that i can trust awesome !!! Great little paring knives. Would love to see them in 4" size, as well. These match perfectly with the other Mercer knives. We were able to get 2 different color handles for the different sides of our Kosher kitchen which is always a plus!! This is my favorite paring knife so I'm going to buy more of them. I have small hands and this fits me just right. And the color helps me locate it quickly. It nice and sharp too. Oustanding construction of this product, fits great in the hand, light weight yet sturdy for long use. Costed out just right! Easy on the wallet yet strong enought to last. We love these knives. Very light, durable and sharp! Way better than anything you can find at other retailers! These handles never break, not like the wooden ones! Got this great paring knife to go along with the beautiful bright green M23930GR that I bought from Webstaurant on February 20th, quality is excellent, but I was a little disappointed because the blue color of this one is much darker than pictured. Still a wonderful deal on a very sharp knife. Incredible knife for the price. Very light weight and strong. Excellent steel quality and easy to use and clean. Just the right size for small jobs. this sharp knife is great for slicing lemons, making fruit sculptures and fits in any drawer. i hang it up on my magnet bar, but can fit anywhere! easy to use! It's an economy knife but still very sharp. We had it one day and a bartender decided to grab it and try to pry his drain cover up with it. Bent the tip. I wanted to jab it in his neck but refrained, it's not his fault he's an idiot, it's our own for giving him a job. We have bought several of these knives which are great to cut lemons and limes at our bar. Now we buy the various colors offered to know when they get moved to other areas of our restaurant.